I was invited by the Dakshina Dvaraka again to another concert presentation program yesterday and I had an absolutely marvelous time learning some things about Carnatic Music that I had not known before. You can learn something about the program from the PDF that I give as a link here. I was well primed to expect the unusual by an article in the local press about the event and I was not disappointed. Among the most unexpected information that I gathered was the fact that the Thanjavur court used Telugu as official language despite the rulers being Marathas and the state being located in the heart of Tamil speaking area. It made sense as the State was originally ruled by the Nayaks who were Telugu speaking rulers, but such a blend of three languages in one state suddenly made sense with the explanations given by Dr. Sumathi Krishnan. The enjoyment was however short lived as I was exposed to something that I had not experienced in decades. It is a custom that before one enters the particular concert hall where the program was held that the audience removes its footwear outside the main hall. I had known about this and worn a pair of slippers that I could easily get in and out of. On coming out of the hall to put them on again, I was shocked to see that they had been taken away by someone either accidentally or deliberately. A couple of well wishers helped me to search for them in three different locations without success and I walked out of the building on bare feet before I could into a vehicle to go home. A lesson learnt and if I have to go there again, I would remember to carry a bag in which I could carry the footwear inside and come out to wear them again! I would however try and persuade the management before hand to permit people to wear footwear inside! I shall keep my readers informed. This entry was posted in History, Humor, Music, Nostalgia, Raves and Rants and tagged Dakshina Dvaraka, Dr. Sumathi Krishnan, Footwear robbery, Thanjavur. Bookmark the permalink. 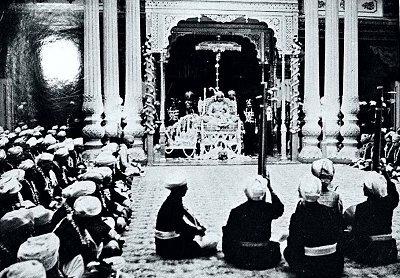 13 Responses to Maharajas And Music. Yes, it was awkward to walk barefoot on the main road till I could get into a vehicle! What a disappointment! I’m with you, bring a bag for your slippers just in case they won’t change the policy. They are unlikely to change the policy and so yes, the bag will be the answer. i’ve often wondered about that in certain places… like japanese restaurants where they insist you remove your shoes. or even those great temples… how does one find one’s own shoes out of such a mass of them! as you say. best to carry them with you in a bag. that’s where women’s purses would come in handy! In most places like temples, there are usually contractors who take charge and issue you a token so that on return the footwear can be easily found. two things … i don’t know how in the world school children can learn india’s history! it seems so complicated. the different areas and languages! i love reading it… and when i get to the end i have already forgotten most of what i’ve just read. of course their minds are younger and sharper! and… i NEVER wear my shoes in my house! i have a little chest they’re kept in. they’re taken off at the door and it just feels so much cleaner. i’m like the expat person in the link. i’m a barefooter now! Yes Tammy, Indian history is not of one area or of one people. There are so many stories that I doubt that anyone can put it all together to even just study in one lifetime. You bet that the next time around, I will go with a plastic bag in my pocket. As before, I wish I attended this session. I would have soaked it all up. Wonderful Ramana-athan that you’ll filling your time with such a wide variety of things. On my recent trip to Cherrapunji, Meghalaya, I spend an entire day walking barefoot. The feeling of connect is hugely uplifting! After the initial discomfort I find myself a lot more present and aware, I slowing down to carefully tread the slippery rocky paths. Even considering the disproportionate consequences if you fall, you should do it by choice than by accident. Start small. Maybe on your evening sojourn to the park. ahh…green wet grass on bare feet !!! I walk barefoot on the grass in our park whenever I go there with sandals. Taking off the socks and shoes is a bit of a problem when it comes to putting them back on again. You could bring two pairs, carry one in with you, and leave the other outside booby trapped. Top class idea. With indelible ink spraying on anyone touching it!